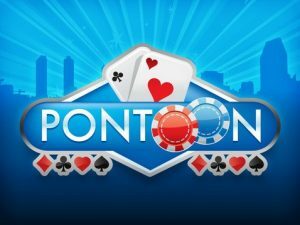 The Pontoon game is in 2 folds both of which are completely unrelated to the very popular Blackjack game. 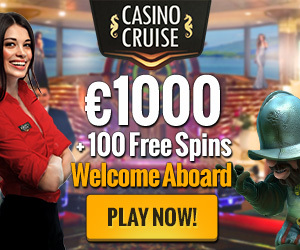 There is one played at online casinos that leverage Real Time Gaming software to provide world class entertainment to their customers and the other is played in Australia and the rules and codes are similar to the Spanish-21 game which is popular in North America. The first type of Pontoon is what we will be discussing mainly because it is by miles better than the traditional blackjack with a significantly better house edge at more than 1/3 lesser than what Blackjack offers. The fixed rules dictate that the dealer hits soft 17, the double after split is allowed and that the dealer doesn’t take a hole card. The player is only allowed to double on cards with face value of 9 to 11 but if a player doubles on a soft hand, the ace will then automatically count as 1. Late surrender is allowed for players particularly when the dealer has a ten or an ace up. 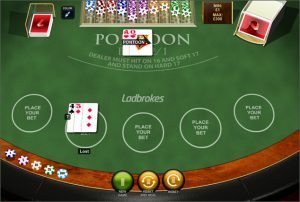 A laminated marker indicating surrender will be placed on the player’s bet and if the dealer gets a blackjack, the player automatically losses the entire bet. Also whoever gets a 21 or blackjack wins immediately. Players are also allowed to surrender after doubling which is commonly known as double down rescue. The player then forfeits an amount the same as his original bet. However since the surrender is adjudicated immediately, it is treated just like an early surrender. It is also important to note that a five-card 21 pays 3 to 2 while a six-card 21 pays 2 to 1, a seven or more card 21 pays 3 to 1 but bonuses will not be paid if the player doubled. Also a 6-7-8 or 7-7-7 of mixed suits pays 3 to 2. If they are of the same suit, it pays 3 to 1, then again, the player will not be entitled to any earnings if he doubles. Lastly, a suited 7-7-7 means that the player has a seven face up and pays 1000$ for bets of 5$-24$ and not less than 5000$ for bets of 25$. In addition to this largesse, all the other players receive a 50$ bonus widely known as the envy bonus. Again, this bonus doesn’t pay if a play split or doubles. The no-hole-card popular in European countries is one rule that favors players in Pontoon. This is because with this rule, a player automatically wins even in cases where the dealer gets a blackjack. More so, in the American Spanish-21 game, the blackjack beats anything except a player blackjack which kind of reducing the player’s odds. Variable rules dictates that there has to be between four-eight Spanish decks, a hole-card rule and various possibilities which include the number of splits allowed either one or two, splitting the aces which may or may not be allowed. Doubling may be allowed with any number of cards or only two if that is what is available. Further dissecting the Hole-Card Rules, what will then happen when the player doubles or splits and the dealer gets a blackjack? Well, it basically depends on the casino you are playing at. In many gaming establishments, the rules followed originate and is mainly followed in Australia so many casinos had to coin new terminologies. Original Bets Only (OBO): This rule is strictly adhered to in North America where the player will only lose his initial bet if the dealer gets a blackjack. The usual practice is that the dealer peeks at the hole card to know if a blackjack is possible. This is to ensure that players don’t waste time trying to force a win against an unbeatable hand. Sometimes, this rule is followed even in Queensland. Buster Bets plus One (BB+1): This rule dictates that the player will lose any hands he busted with an additional equal to his original bet if he has anything else remaining. Original and Busted Bets Only (OBBO): This rule ensures that the player loses any hands he busted plus an additional amount same as what he wagered per hand. For instance where the dealer gets a blackjack, the player will be penalized for splitting but never for doubling. European no Hole Card (ENHC): This rule is one that ensures that the player loses every bet currently on the table provided the dealer gets a blackjack.